The idea of a transparent force bag was devised by U.F. Grant many years ago, and he wrongly called it "Transparent Change Bag". This idea was a breakthrough for stage mentalism, and later on Jeff Busby and Gene Nielsen created a Zip-Loc-like model. This one is also a Zip-Loc-like model, but it has 3 compartments instead of 2. The red line will help you to know which side you are using. 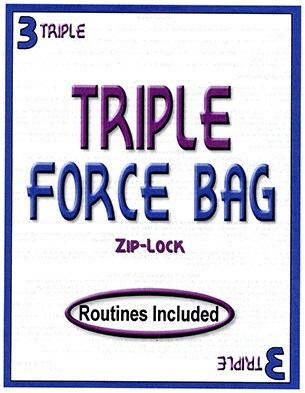 If you want to use 2 compartments only, close the Zipper of one bag, and that's it, now you have a regular double force bag. Dimensions Approximately: 13" x 9.5"